This article is about the city in Turkmenistan. For the river in Afghanistan and Turkmenistan, see Hari River, Afghanistan. 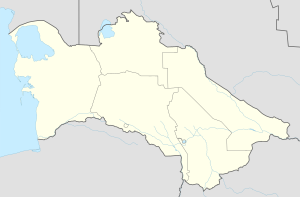 Tejen (older spellings: Tedzhen, Tejend, Tejent) is an oasis city in the Karakum Desert, in Ahal Province of Turkmenistan. It lies along the M37 highway, between Dushak and Mary, 223 kilometres (139 mi) by road southeast of Ashgabat. It has a population of approximately 52,000. To the east is the larger oasis of Merv. The town contains the Charman Ahun Mosque, the Hotel Tejen, and numerous fertiliser and textiles factories. In 1883 it was occupied by General Komarov during the Russian conquest of Turkestan. In 1916, when the Turkmens participated in a revolt against the Russians, Tejen was a hotbed of activity. Tejen is known for its melon production, and contains numerous fertiliser and textiles factories. It is also known for its narcotics, which are known locally as "Tejen tea". The town contains the Charman Ahun Mosque and the Hotel Tejen. Historical records indicate that the Caspian tiger occurred in this region. It is a stop on the Trans-Caspian railway, and in the 1996 a new line to Mashhad in Iran was opened. ^ Google (9 October 2016). "Tejen" (Map). Google Maps. Google. Retrieved 9 October 2016. ^ "Turkenistan". Encyclopædia Britannica. Retrieved 8 October 2016. ^ a b c Brummell, Paul (2005). Turkmenistan. Bradt Travel Guides. pp. 129–30. ISBN 978-1-84162-144-9. This page was last edited on 2 July 2017, at 12:47 (UTC).